We analyze the intensity and patterns of use of fixed and mobile broadband consumers in Portugal. If usage across types of consumers is similar after controlling for individual characteristics identified to be important drivers of adoption, then it is more likely that consumers view mobile and fixed broadband as somewhat substitutable. Such a result is important for studies of broadband impacts; specifically, for discerning whether mobile broadband service will have a similar level of impact upon social and economic development as fixed broadband services have had. 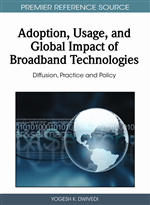 Results indicate that broadband uses are similar across fixed and mobile users, suggesting that the technologies are somewhat substitutable from customers’ perspectives and raising the possibility of limited differential effects on innovation and other social goals. Results of interest include the characteristics of Internet users by technology, and differences of usage patterns reflected by individual characteristics. The economic importance of broadband is well accepted, but there is much that we do not know about how various technologies of broadband delivery differ in their commercial viability, effectiveness, and value. In some countries, such as the United States, customers often can choose between fixed technologies (such as DSL, fiber to the home (FTTH), and cable), and can access wireless broadband through WiFi and third generation mobile (3G). In other countries, where cable television is less well developed, customers generally do not have the option of choosing cable for broadband access. Japan is emphasizing FTTH in its broadband policies, and also relies on DSL. There also are countries, such as Portugal, where wireless broadband is expanding rapidly. Whether customers view these various technologies as providing equivalent broadband access is important for public policy reasons: a country that is predominant in one broadband technology may be so because regulatory policies include technology biases. Such a country could be at a competitive disadvantage if its populace would find a different mix of technologies to be more productive economically and socially. On the other hand, if alternative broadband technologies are close substitutes, then a country could waste resources promoting a change in technology mix.